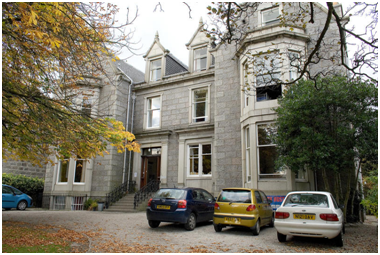 Aberdeen Youth Hostel is a 4-star Hostel located in a quiet residential area on the west of Aberdeen. It offers a wide range of accommodations which include private rooms, shared accommodation, and en-suites. Parking facility is available too. The rooms are spacious and equipped with self-catering kitchen and dining area, TV and wood burning stove. You can book accommodation online. Aberdeen hostel is fantastic with granite architecture. It is rich in history. The city center nearby bustles with nightlife and has several cafes, restaurants, and bars. There are several historic and beautiful locations around the Aberdeen hostel which include Maritime Museum, Aberdeen Art Gallery, and St Machar’s Cathedral. Adventure lovers can take a boat trip to the harbor and the dolphins. Around the city, there are attractions such as the impressive Dunnottar and the Crathes Castle and the picturesque fishing village of Footdee which are worth seeing. Aberdeen hostel is a beautiful place to stay at. It has very friendly staff. There is a bus stop right outside the hostel to visit the city centre. The kitchen provided with the accommodation is equipped well. The rooms and facilities are kept neat and clean. The bathroom is also clean and houses showers and other facilities. Though no locker facilities are available, your belongings remain safe. The hostel is just a few minutes’ walk from the city center as well as train station. If you have any query, you can contact the Aberdeen hostel staff. You can call at +44 (0) 1224 646988. You also can send an email at aberdeen@syha.org.uk.